New England Tree Experts - Tree trimming, cutting, pruning and maintenance. Stump removal. We are a utility contractor based in Vermont that provides vegetation management solutions to the electric industry and municipalities. Our organization has been servicing the utility field for over 41 years and has vast operating experience in both Transmission and Distribution right of way management. We have the knowledge and skills required for the demands of both as well as a proven record of effectiveness in storm response. Customers currently served by us include CVPS, Vermont Electric Cooperative, Littleton (NH) Water and Light as well as other smaller municipal electric companies. We operate a fleet of aerial lift trucks ranging in reach from 55 up to 75 feet, chippers from 12 inch to whole tree, excavators with brush mower attachments and all other associated tooling for both roadside and off road applications including herbicide application which we are licensed for in Vermont. Our current corporate structure consists of Ryan Molleur as President and John Molleur, certified arborist, as Corporate Secretary and crew supervisor. Doug Littlefield has recently joined us as Business Development Manager. We also engage the assistance of other consultants as necessary to meet the demands of additional projects beyond our typical scope of business. 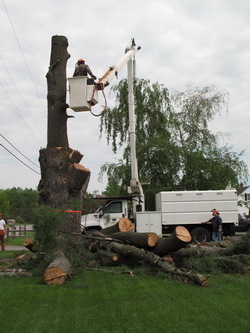 Our crews are complemented by foremen who are qualified line clearance tree trimmers that oversee specific job operations. Our training consists of the guidelines set forth in OSHA 1910.269 as well as the ANSI Z-133.1 safety standard. All operations in regard to pruning are done in accordance with the ANSI A-300 pruning standard. Our company conducts regular site visits with crews to address pending concerns as well as conducts routine safety training in regard to aerial rescue, CPR, First Aid, electrical Hazards and other associated safety requirements. We are currently growing the business throughout New England and beyond. We have the capability to send crews and equipment far afield for contract work and to assist in emergency situations of any magnitude. If we can provide you with information, or discuss how our services and expertise might benefit you please do not hesitate to contact us. Copyright © 2009 - New England Tree Service, All Rights Reserved.